In 5th grade, you might be introduced to important science concepts that you find confusing or hard to understand. If you're struggling with your 5th grade science homework, continue reading to learn about homework strategies and other ideas to improve your science grades. How Can I Improve My Grades in 5th Grade Science? During 5th grade, you'll likely be expected to know basic scientific methods when performing experiments in the classroom. You also might explore how organisms function, as well as studying the Earth and solar system. To set yourself up for success in the classroom, be sure to come prepared with all the class materials and supplies you'll need. Write down the key points of the lesson in your own words. And, if you miss a class, consult with your teacher so you don't fall behind. To help yourself focus when working on science assignments, create an uncluttered, distraction-free study area in your room. Try not to use this area for other activities; having a designated space just for studying may help you concentrate and finish your homework on time. Make sure to keep your study area stocked with all of the school supplies you think you might need, like pencils, scissors, paper, erasers, rulers and markers. As you study, write down key details from your reading assignments. You may find it useful to answer the questions at the end of a reading or chapter to measure your understanding of the material. If you're still unclear about anything, ask a parent, older sibling or someone else for help. Another useful way to improve your science grade is to meet with your science teacher to go over what you're struggling with. Ask your teacher for extra exercises or ideas to help you learn the information you'll be tested on in class. It may not sound fun to do extra assignments, but just a few hours more of study may be what you need to understand tricky scientific topics. Your teacher is also more likely to think that you're serious about improving your science grade. Additionally, you might check with your teacher to find out if there's a peer study group to help you in science. Your local library may have a list of tutors who can sit with you and help you work through challenging science homework, although there may be a fee for these services. Sometimes, these tutors are certified educators with professional teaching experience. Some libraries also offer free online tutoring and homework help at certain times of the day. You typically need a library card and an Internet connection to access this service. You also can check with the local high school to see if students there are available to help you in science. Science homework can be confusing, especially when it involves math formulas and equations. 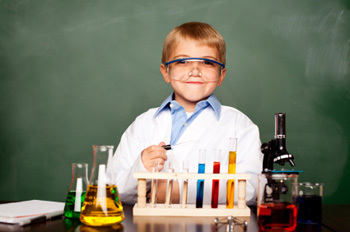 Students who have difficulties with their science homework can find homework help online through educational websites. Schools Failing to Deliver Acceptable Science Curricula: What Can You Do? Would You Want Your Student Learning Creationism in Science Class? Does Climate Science Belong in the Classroom? Will Schools Be Teaching Science Fact or Science Fiction? Mad Libs: A Fun Word Game That Teaches Nouns, Verbs, and Adjectives.